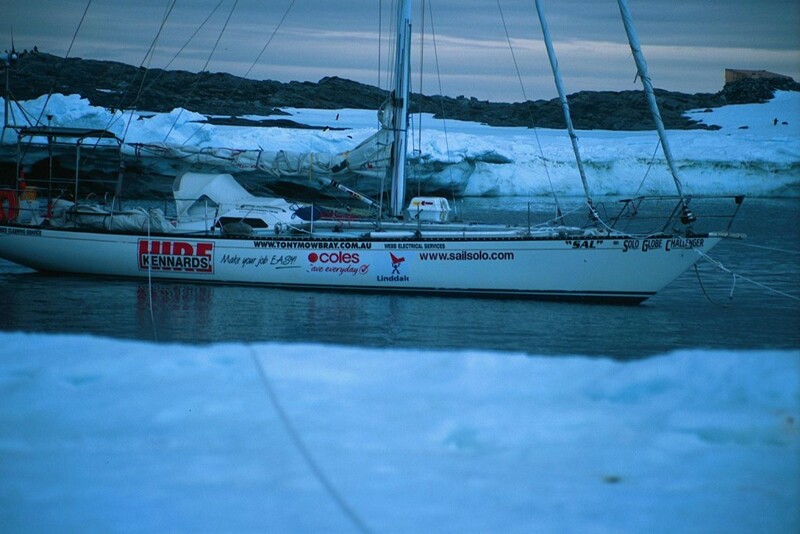 In December 2003 Tony and a team of four set sail for Commonwealth Bay, Antarctica. Mawson’s Hut is the last remaining testament to early Australian polar exploration and this tiny little pre-fabricated Baltic Pine timber hut clings precariously to existence just 100 metres from the shoreline, fighting for its very life. It is the Home of the Blizzard! Tony’s expedition saw he and his team sail to this very remote and isolated part of Antarctica where assistance is NOT readily at hand should you need it. 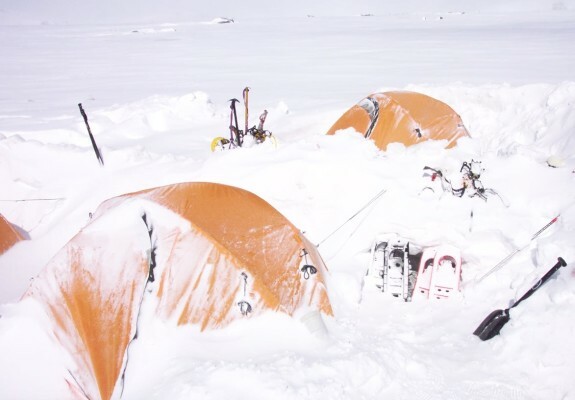 It was an adventure full of danger, calling on all sorts of skills plus leadership, courage, teamwork and unswerving focus as they experienced mountainous seas, the screaming sixties of latitude, icebergs, pack ice, and wind chill cold enough at times to snap freeze any exposed skin. On the return leg when 550nm south of Tasmania smack bang in the middle of the Great Southern Ocean they were “knocked down” by a horrendous 60ft wave. Turned upside in a split second…..
We have been hove to with a storm tri-sail only for over 24 hours in a SSE gale with winds constantly between 40 to 50 plus knots. We are really being asked to tough it out big time. It is VERY, VERY cold with big seas, relentless blizzard conditions full of stinging snow and sleet. We have made NO forward progress for a day, in fact we have been pushed backwards on occasions almost as though the Antarctic powers that be don’t want us here. We have come this far and we are so close. Right now, you are seeing the word frustrated defined before your eyes. We are having to keep one crew member on deck at all time (with another below on standby) to scout for rogue ice so we can take evasive action when needed. We had a VERY close call with a bit of this frozen enemy last night, but we are 200% determined not to let anything spoil things with Commonwealth Bay so close. The interior of the boat is now very damp and wet through a combination of condensation or sea water and snow brought below on our wet weather gear after a 30 minute watch above. I had to force myself to the computer to write this update. Let’s just say that right now it ain’t a lot of fun. We are in a holding pattern – not pushing, just waiting for it to blow itself out. Where do I start? For the first time for a long time, I’m just not sure! I have so much I want to convey, I don’t want to miss anything and I don’t want to go on forever either but rest assured in this instance I could! 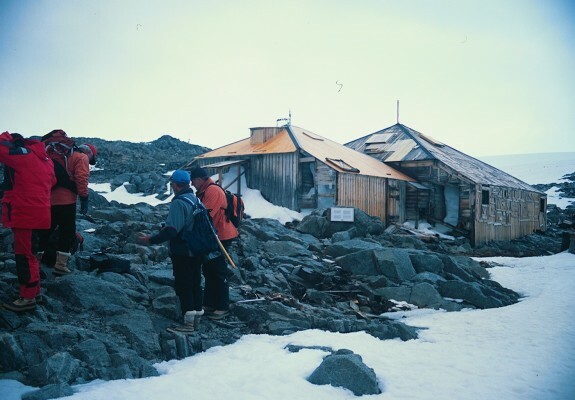 Mawson’s Hut itself. An aura shrouds the hut and surrounding area where the passionate young men of the Australian Antarctic Expedition lived together so many years ago. My reaction drawing near to the site was one of disbelief “this is amazing! I don’t believe it! How good is it? Have a go at this!” and so on were typically quiet almost inaudible acknowledgments of what I was privileged to gaze at. It has been absolutely belted for over 90 years by an incredible force of nature. The all timber structure (Baltic Pine predominately I believe) has been abraded constantly by driving snow, ice and grit. The exposed timbers are a fraction of their original thickness and in many places within a millimetre of their existence. Yet this monument to early Australian Polar Exploration stands defiantly … looking the constant blizzards right in the eye! If you have just one ounce of patriotic Aussie blood in your body you should feel mighty proud of what Mawson and his men achieved! Surrounding the hut on all sides is what is officially called “Artefact Scatter”. I reckon it’s the “stuff” they left behind! It paints an incredible picture. Everywhere you look, you name it, it’s probably in there somewhere – timber cotton reels, knives, matches, shoes, mittens, trousers, balaclavas, hand sewn gloves, nails, coal for the stove and the bloody stove is there as well! I didn’t see the kitchen sink but I reckon it’s in there somewhere! The list could go forever! On the Eastern side, stacked up are many sealskins and many bodies of penguins that have sat there for over 90 years, neatly stacked. They were gathered ready for consumption oh so long ago. They (the stuff) have been flung far and wide in a northerly direction by the intense southerly winds and it’s indeed sad to think that so much of this rich history has already disappeared into the waters of Boat Harbour and beyond. During our stay I’ve found myself spending time looking at the hut and surrounds, then wandering off to climb a nearby rise or look at a Weddell Seal but always drawn back to stand and gaze, trying so hard to take it all in and reach a higher level of appreciation. The team, Matt, Graham, Andrew, Ron and me agree unanimously on so many points. It is an honour and privilege to view this unique part of our history and heritage and now having been here we are more in awe of Mawson and his teams achievements then we ever were. In terms of its future we are all keen to find out PRECISELY from those that are charged with its preservation what the plan EXACTLY is? We are all agreed that if left to the elements it will return back to the earth, dust to dust! What a hell of a shame that would be. Every effort should be made to ensure that people 993 years from now can marvel just as we marvel today. What is a knockdown? When a wave picks up your 8.5 tonne yacht and smashes her down sideways as if she is a rag doll. The boat is engulfed, the mast ends up underwater and you are fair dinkum close to thinking “that’s all folks”. We are talking SMASHED, just like a canon has fired a broadside at you! It is not a pretty sight. About 55 hours ago I was on deck on a dark night, we were hove to, firmly in the grip of an adjacent 50 knot Westerly with some savage steep 30 to 40 foot seas ripping through. The crew was below when KABOOM, over she went! I was driven face first into the backstay with my head jammed up underneath the solar panels and I ended up submerged under solid green water. I became light headed, almost as it I was about to pass out or something but for some reason all I could think and say to myself was “Stay conscious, you MUST stay conscious, Tony you HAVE to stay conscious!”. After what seemed like an eternity (it always does) up she came with the cockpit absolutely swamped and ropes and stuff everywhere on deck. I grabbed the wheel in my light headed state and off we went downwind trying to get some idea of what happened below. Are the guys OK? Is boat taking water? Is boat structurally OK? Is the mast and the rigging OK? So many questions and they all hit you at once. Graham sustained some injuries when he was catapulted from the left lower bunk across the cabin hitting the underneath side of the deck on the right upper side, crashed to the floor and when the boat righted herself, he was smashed back into the base of his bunk. He did a 360 degree tour of below decks whilst completely cocooned in his sleeping bag. Ron and Matt worked hard getting below deck under control, digging all sorts of major items out of the bilge, putting floorboards back in place, picking up debris strewn all over the cabin. Left over food was spattered everywhere. You need to remember with a motor vehicle accident, it all stops when the car stops – the ambulance arrives and patients go to hospital. Out here with a knockdown it still keeps blowing, waves keep rolling through, it stays pitch black dark, you are still 550 nautical miles from Tasmania and any help, you are waiting for the next knockdown, you are not human if you are not, excuse the language, shitting yourself! Andrew burst through the hatch with a “what can I do to help Tony?”. I got him onto the wheel to steer. Now this is a daunting task for your first time in these conditions. Andrew just gave everything he had, keeping our boat on course while we got some order about things. Andrew is the quiet achiever amongst us, the thinking type who is definitely not scared to take it on, and take it on he did, guiding Solo Globe Challenger down the face of each and every wave. Go get the bastards Andrew, don’t let ’em beat you! He did go get ’em and they didn’t beat him! 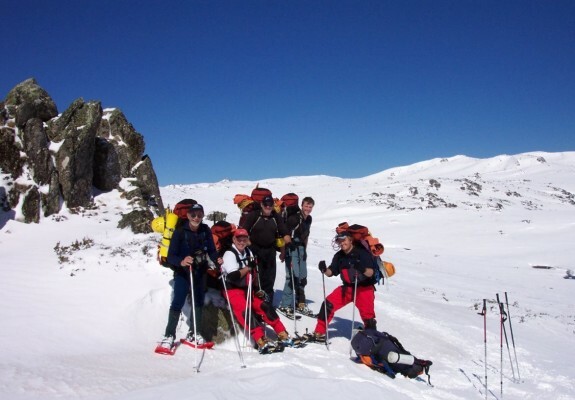 I think these guys wouldn’t mind me saying that they are just ordinary blokes but let me assure you that out here they have achieved extraordinary things. There was no doubt we were all a bit shell shocked and we went into “existence” mode, just doing the necessary to get through the next hour on the wheel, eating bugger all, no hot drinks.. Hour after hour Andrew, Ron and Matt took their turn on the wheel whilst Graham remained too injured. We eventually unfurled a small amount of headsail started to bring her around to head more to Tasmania. Tentatively we pulled away on the big waves and headed her up on the smaller ones. l liken it to boxing, hit but don’t be hit! Look for an opening, get in there and head for home but then get out of the danger zone …look for the next opening and get in there and have another go. Around 11.00 that morning, Matt was on wheel when he got to look it in the eye. The 22 yr. old kid from Panania doesn’t mind admitting “it’s been full on out here!” but he hasn’t missed a beat. Matt saw it coming some distance away, he started to pull away, realised it was going to get us. He watched it get higher, higher and higher, lipping and breaking at the top. He screamed “HANG ON!” and 10 feet of white-water and the body of the wave hit us side on. Matt crouched, hanging onto the wheel, thinking “keep your eyes open, this maybe the only time I see something like this”. He got smashed into the solar panel frame, his body started to lift and he thought he was going into the water and just hoped his safety harness would hold. He didn’t go in and as this battleship of a boat sprung back upright he had a great view of the bottom of the mast spreader rising out of the ocean. 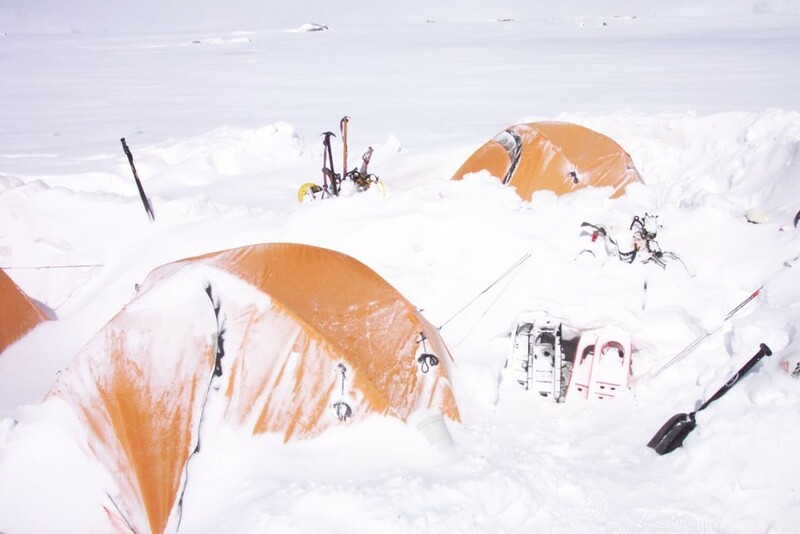 For me, every part of this expedition was what attracted me in the beginning, not just the end result. Dreaming, preparing, the setbacks and hard times, the good times, teamwork, and of course the opportunity to be one of only a select few to visit this extraordinary place all influenced my enthusiasm for this project. I could not have predicted how this expedition would affect me. It has changed my life and will be with me forever. Until you are caught up in the chaos of a knockdown, no words can reflect the bedlam and the confusion. A flash, the surreal images only registering as I replay the moment in my head. A shouted warning, the red clad figure of Tony on deck disappearing behind a wall of white water as I am laid horizontal. Strangely, The “Knockdown Day” does not rate as the worst day of the trip. On the other hand there have been so many brilliant and lasting highlights along the way. The magnificence of iceberg alley, the pristine weather for our stay at Commonwealth Bay, Penguins, Whales Seals Albatross, clear nights under a full sky of stars and the bond formed amongst the crew. I have no regrets, it hasn’t been a laugh a minute, but the lessons learnt and the sights seen including the Southern Ocean’s raw power have been worth it. I leave you to climb into a sun drenched cockpit to watch the waves roll by … headed for loved ones and dry land. Whatever you can do or dream you can … begin it.